Adults - Add 1 rounded scoop (48 g) to 8 oz. of water or your favorite beverage. Stir, blend or shake well. Blend for best results. Take two (2) times daily, preferably before or after activity or exercise. Consult a health care practitioner prior to use if you are pregnant or nursing, taking prescription medication or if you have a serious medical condition. Discontinue use and consult a health care professional if any adverse reactions occur. KEEP OUT OF REACH OF CHILDREN. 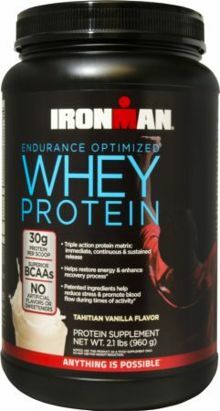 IRONMAN Endurance Optimized Whey Protein is formulated by sports nutrition scientists to deliver advanced benefits along with superior levels of lean protein with fewer calories and less fat.